Till now we have studied the Northeast street thrust. Now we will see Eastern Northeast street thrust, when the street focus strikes the ENE (East Northeast) of the house it is ENE street thrust. In general road thrust hits a house or factory of plot or any other construction at Northeast-east or Ishan or Eshan side is likely to be called as Northeast-east or Poorvaeshan (Purva ishan) street focus. This is second best one when we compare with Street focuses. The first one is exactly Northeast Focus. Its really amazing, in general we cannot get these type of house for purchase, because this type of houses or factory are always in a very good position, so they don't go for sale, this street focus is mixing with East Eshan and Ishan, so this street focus is having a power of East and Ishan Now we discuss about the good results of this Easteshan street focus, generally this Easteshan street cannot render bad results to the residents of the property. The effects of ENE street thrust are very similar to that of NE street thrust. The residents will enjoy overall happiness. However taking due precautions these benefits can be sustained for generations. They will enjoy name, fame and status In the society. Some such precautions are building the house vastu compliant. 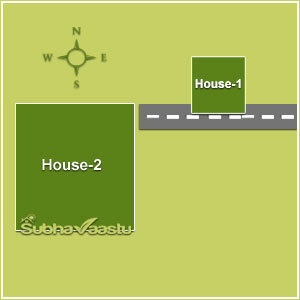 Including the perimeter wall and observing other vastu principles in the house itself. As a matter of fact this principle is relevant in all cases of benevolent street thrust. He could have sound thinking because his present residence, though rented, was having NNE street thrust. Name, fame, exemplary progress in life. Completing every undertaking in a happy situation thus acquiring financial benefits too. Increased earnings and building up of assets. Every problem being resolved amicably including apparently intangible ones. Promotions and handsome raise in earnings. Fi they be leaders, climbing up the ladder. the progeny may develop the good personality. Being able to acquire all that is needed in the house. One road is hitting the house from Northeast-eastern direction, the street focus is called as Eastern Northeast street focus or thrust. The effects of ENE street thrust are very similar to that of NE street thrust. The residents will enjoy overall happiness. However taking due precautions these benefits can be sustained for generations. They will enjoy name, fame and status in the society. Some of these precautions are - building the house vastu compliant including perimeter wall and observing other vastu principles in the house itself. As a matter of fact this principle is relevant in all cases of benevolent street thrust. Eshan veedhi shula and there is East road to the House. There is East road and ENE street thrust while constructing house leaving more open space towards North is recommended, please ensure that the East road should not join theSouth road if there is any adjacent to the property. 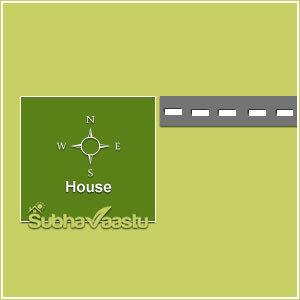 In that case the house is called as Southeast block house and having Ishan shula. North road to the property and Kutthu from purva ishan. along with ENE , the road is on the North side of the house. In such cases while constructing best to leave open space towards East direction. 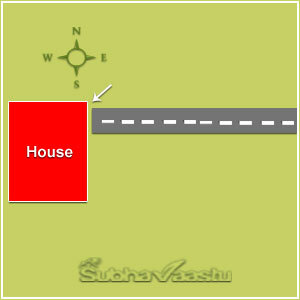 This house is greatly beneficial as there are as besides ENE there are roads towards North and East too. 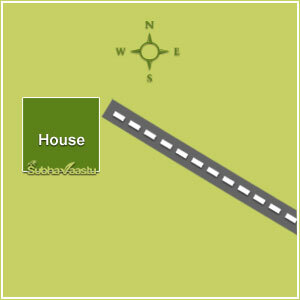 Please note that there should be houses covered to this house towards South and West directions, and the site should be 90 degrees as per compass. If there is any skyscrapers towards Northeast corner, then think twice before buying this property. This is said to be excellent property. If you found to have such property, you may buy it. This is having North and East road, the East road is running towards North and North road is running towards East and moreover it has ENE (Eastern Northeast) street focus. Generally, these blocks are not came for sale, if it was came into market for sale then the meaning is the residents would like to migrate to other places etc. 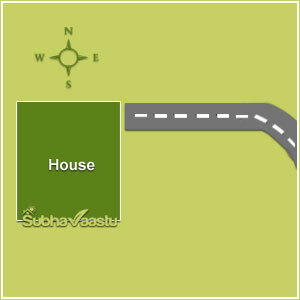 If the inside vastu is perfect then its almost a mini heaven. Observe the wide street and narrow street, both may be shadowed ENE focus on House, but "A" property is more better results oriented than the "B" house, why it is like so?. Because this A house is having more bigger road towards North, additional benefits will be added to A house. 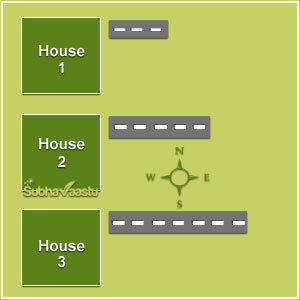 Regarding B house it has only narrow North road, it may does not such additional benefits when compare with A House. In vastu shastra observation is most important. 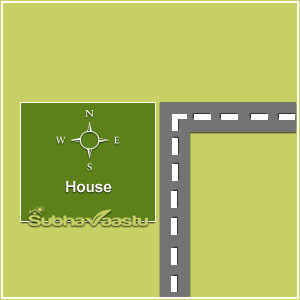 Many visitors enquiring about their searched properties is having Street focus, but they failed to say the exact description and facts of the property (matter came from subhavaastu.com website) and finally they would blame the vastu consultants, that is why phone consultation is not at all recommended. An experienced vaastu consultant would easily detect seemingly apparent street thrust which are supposed to be ENE and which infact are not. In this regard we had already noted that apart from this part, where the street thrust occurs, it is also important to note as to where from the street itself has started. Some of the streets may have curious bends also. There is ENE street thrust. This street is rather small. This is generally good. This house does not strictly come under ENE banner. 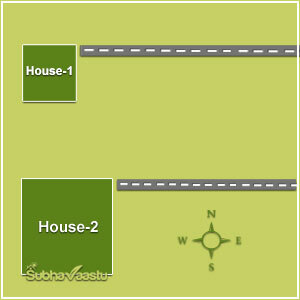 The thrusting streets as emanated from East and hence will bestow only East street thrust benefit results, if there are no houses towards South side of this road focus and houses towards North side then it may bestows with Southeast forces to the house which may effect some bad to the residents. In figure 55 the ENE street thrust is infact starting from SE of the house, through striking at ENE as a matter of fact this is not a benevolent ENE. 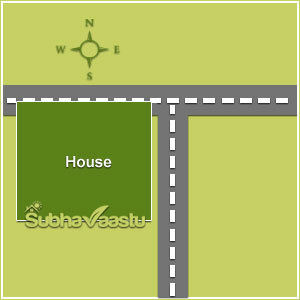 In neighborhood vastu street thrusts are an important factor. Though ancient literature also mentions various street thrusts, traditional vasthu scholars do not pay due attention to the street thrusts. I had discussed this aspect in my volume in “SubhaVaastu” and even appealed to the Government. This book was released in February 2004. Till now not a single query from government has surfaced. However it is not astonishing that many of the government employees do consult me for their own constructions. Thus society stands neglected. In such a scenario I only can fervently appeal to the powers that be. Till now in this regard the results are negative. (it is interesting to note that the town planning for new delhi i.e., Rasthrapathi Bhavan, parliament House, North Block, south block and the residential complexes were designed on sound vastu principles) no doubt we should prosper and so also the society. If we think on this constantly a day may come when the powers that be also start thinking alike. My grand father was imprisoned during freedom struggle and was incarcerated for two long years, during which time my family underwent innumerable hardships. My father was a small child then. By every standard our family was prosperous and my grand mother used to tell me about the hardship they faced when my grand father was imprisoned. Often they slept hungry. I used to cry hearing the hardships from my grandmother. During imprisonment my father was treated like a pariah, a privilege bestowed on jailed freedom fighters. Often I used to wonder how I would repay his debt. Alas time have changed now. Earning has become rather a crude passion. Does this not lead the society to extreme degradation ? History tells us to mend our ways. What image we bequeath to the future generations, I leave it to you. It is in this strain I again appeal to the leaders. 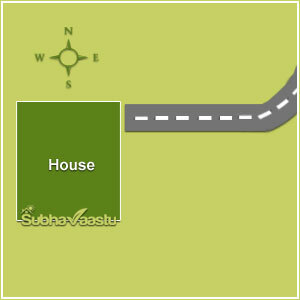 It is not adequate that our homes alone be vastu compliant. This should be extended to public utility buildings as well. In any case there is no harm in adhering to vaasthu. There may even be extraordinary benefits to the society, I do realize my anguish expressed here, rather out of place, has no relevance to the subject matter. 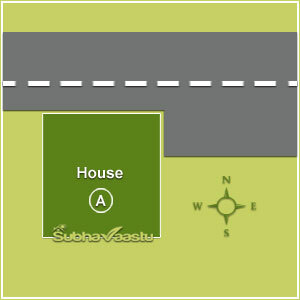 I am prepared to give my vastu advise free to government constructions. It only needs a will for the leaders to profit by this science. Now a days a fashion is going on, many residents are now reading two or three vastu books and browsing some websites and they are adventuring by buying the properties and doing their own style of vastu alteration corrections to the properties, this is too dangerous, we are humans but all the faces are not equal, many identifications for many people, all are not same, same also to the properties, readers thought that if one property is having such qualities and providing some results, they feel that all the other properties also giving same results, though the plan of the houses may be equal and no change but surroundings might change in each and every part, please be cautious when you are going to buy the properties or doing the corrections, approach one expert and the best vastu consultant in your area and show your interested property to him, after that only decide for consideration. General saying : Good results of Easteshan street focus are leadership qualities, name and fame in the society, total satisfactory life, enjoyment, pleasant trips, busy with currency calculations, success rate is increasing year after year, jackpots, fun with friends and relatives, foreign trips, good life, works go smooth, good education, noble life, enormous funds, bank deposits, nice character, royal look, good behavior, total family on pleasant trips, good alliance to the daughters, right job for the sons, far distance jobs available and extracting good name and money from there, funds overflow than expecting, authority on all aspects, all amenities in the house, successful hand in everywhere, the head of the family controls all the members of the family and nearby his partners or relatives or friends, he is respected any where, his word will be the final word in the family, many people obey him and goodwill, he is the authority on every event in the family, head commands and controls the members of the family, he will have a successful hand everywhere, but this focus is not responsible on health aspects etc, but family members enjoys good health. These houses are also available to buy, but the owners of that house may gone too far away on transfers or doing new business in other country or state or gone to foreign countries for settlement or stay with their children, these are the reasons for selling of that house, there is no other reasons. If you find any other reason than the above, there might be very strong disturbance at the house as per vastu shastra. 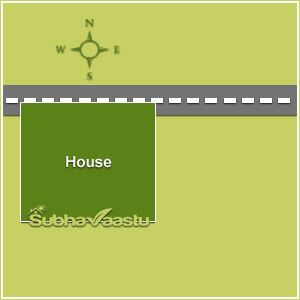 If you find any house of like this Northeast-east street focus is for sales, don’t leave them, just buy them later have your lunch, any way we are insisting you better to approach one expert vastu consultant and show the property and then decide to buy or not, why we are insisting like this because of generally Northeast-east focus houses are not coming for sale, except other than this, there is no any other reason to come for sale of this type of properties in the market, or there should be some other negative point causing for sell, that is why we urge every body to show the property with experts and then only decide further. Three houses having ENE street focus are shown, all the houses are of the same type as also the street focus. 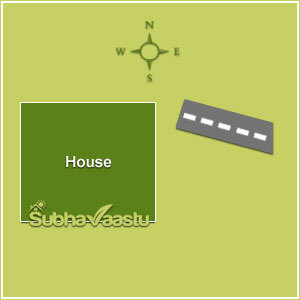 House no:1 .. has ENE street focus where the thrusting street is sharp in length. The second house has ENE street thrust which a longer street and third house similar thrust which much longer street. The strength of street thrust is directly proportional to the length of the road causing such thrust. Let us study now these three houses, study the asterisk and arrow marks the asterisk is quantifying the strength of the street thrust, the first arrow has one, the second two and third three asterisks. One star and arrow carry huge power, two stars and arrows still longer and three stars and three arrows still larger strength. For home -1 the ENE street focus brings immense prosperity and we presume for the third house, the prosperity quotient would be tripled . However this is possible only when the third house is comparatively much larger than the first house. Only then the huge power could be observed by the house and bestow its benefits in like proportion. Only for your conceptual understanding this is shown pictorially. Study the houses one and two, first one is small in size, the second house is much bigger. However the street focus for both the houses is similar. In this case the second house is able to observe the power of the street thrust better than the first. This does not however mean that first house gets lesser strength. See the two houses in figure three having street focus, house number one is small, house number two is very large, however the ENE street focus is same for either house. In this case house number one is able to absorb fully the effects of street focus. In case of house number two even after absorbing the effect fully it is insufficient. In such situations the residents of house number -1 would be benefited much earlier, where as in case of house number two may be delayed. It may also not be totally correct state that the benefits of the street focus bestow similar results to all houses. Streets are never uniform (in size and length and surroundings), they may have peculiar bends and may have several combination effects. Only a competent vastu scholar may be able to detect these and comment on them. Vastu shastra is like a huge ocean and it cannot be quantified. Its depth is unpredictable. Sad in our society, there are people who precisely do the same and deceive the general public. However there are people who seem to feel it birth right to get cheated and some do get cheated due to their thinking and that they should not be extravagant (?) In their payments to competent vastu consultant and thus waste large sums of their hard earned money and time. 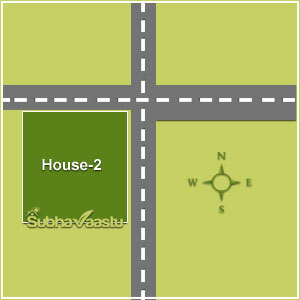 However, there all a few how do posses right temperament and consult accomplished vastu consultant and profit there by. When we studied the following figures we may wonder if ever there are such combinations of the street thrust. In figure though there is benevolent ENE street focus on house number 2 it does not bode well. Consequently the beneficial effects would be delayed. Some other road thrusts has different results on the properties, observe the variation in results. 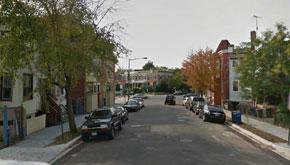 The East Northeast street focus, but it was curved or bent towards south side or right side to the property. We should observe where it was taken bent from the house, what is the distance from house, that we should check. Keep it in mind and observe the below image. The street was bent towards North side and left direction to the house. Here also we should taken note of the distance where the bent was taken action from the house. Now observe this image and above image, the results may be little vary based on distance from the house. If this bent was taken place from long distance from the house, then the results distinction would be very slight when compare with above image. If bent part is very short to the house then results variation is high. This provides more good results than the above image right side curve street. No two streets are identical, they are hugely dissimilar, such being the case, the street thrusts are also dissimilar. There are 8 directions for a house and 8 types of street thrusts are but natural, yielding 64 types of street thrusts, we have seen how there may be several street thrusts in one direction alone, each bestowing its own effects on the house. Only a thorough study at sight alone would reveal the facts. These types of streets or road encroaching houses may be visible in many villages, in towns and cities the number may be lesser but in old cities and towns we may find about these types of roads and encroachments. Now we have seen how certain constructions themselves are transformed as street focus, same could be construed for plots too. This is just explained for one’s understanding. This does not mean that every construction can be construed to be transforming as a street thrust. Some people comprehend as street thrust immediately. Some even could comprehend its consequences and some others their benevolent or malevolent effects rather acutely as also remedial measures for the same. However, I am trying to explain all these phenomena not for scholars but for ordinary earthly people keen to know and hence often side step to explain more comprehensively. When a person having no knowledge of subject reads this book he will be happy to know as it satisfies his logical mind. Others who already are familiar with the subject would appreciate as their knowledge gets acknowledgment and know a bit more. Further people well worst in the subject, even while just glancing through the pages, would appreciate the efforts put in by the other and may even try to talk to him to compliment him for the job done well. As for my self I am trying to be as comprehensive as possible, so that even ordinary folk, not familiar with the subject may grasp it well. 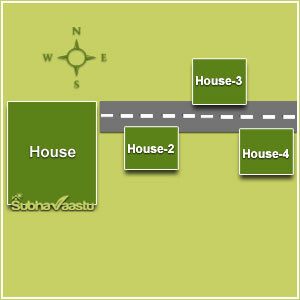 Having seen the order of transformation one can visualize what a street thrust is all above, its important to know, as to which part (direction) of the house is facing the street thrust as also from where such thrust has originated. Simply put, the effect of street thrust is similar to the effect of having an entrance door at that point for going and coming into the house (we know a door in west and south is beneficial and a door at ESE, SSW, SW, WSW, NW, NNW are indeed harmful) it must be well understood that evaluating a street thrust and its effects either malevolent or benevolent will have to be done carefully after establishing the fact of street thrust, comprehensively by physical evaluation alone, we will see this aspect later in this book. any purchase of plot or construction at site. 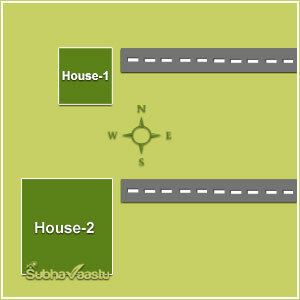 If a house Is vastu compliant the residents will enjoy benevolent effects even though slowly in the beginning. It is but natural to conclude as the period of the residents increases prosperity also becomes enhanced. One should, rather not live in a non vastu compliant house for longer period. Even if the earlier period is indeed good one may have to face tough times ahead. science (described more comprehensively in subhavaastu a modern book written after exhaustive research), the malevolent effects could be greatly reduced. any purchase of plot or construction at site. 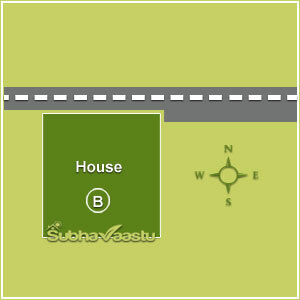 If a house Is vastu compliant– the residents will enjoy benevolent effects even though slowly in the beginning. It is but natural to conclude as the period of the residents increases prosperity also becomes enhanced. 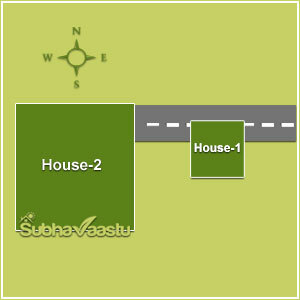 One should, rather not live in a non-vastu compliant house for longer period. Even if the earlier period is indeed good one may have to face tough times ahead. In so far as street thrusts and its effects are concerned, and expert vastu consultant alone would be able to discern and reveal the same. Otherwise with incomplete knowledge results would be disastrous. For your kind information, we would like to show one house which given disastrous results to the results. 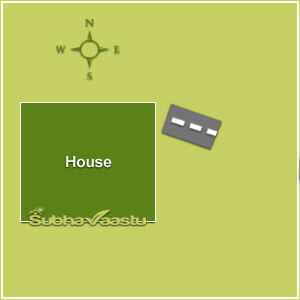 A small mistake spoils entire system in vastu shastra, by reading vastu books and vastu websites information through Internet, one resident taken decision that Eastern Northeast street focus property is good and was bought the property, after only 2 years they lost most of their valuables and defame in the society and particularly they pointed out by their friends and relatives without their mistake. Observe the below image. This is also Northeast-east road thrust, please observe the arrow mark area, there is the main door which is accessible inside to outside, due to this small change the street act as a Southeast-east street thrust and defame the resident. So in vastu shastra everything has to be observed very carefully and then only has to taken the decision to buy properties, ordinary people can't have such a stuff to decide and particularly quacks are wrongly guided the residents. If the door was perfectly placed then this street focus will bless with name and fame and with many more beneficial aspects. Generally resident feels that all Northeast thrust homes are good, its the case, a small mistake which may takes the decision may cause many failures. The unfortunate procedure is many inhabitants nowadays taking wrong decisions by reading vastu books or vastu websites and coming to their own findings, this could damage their status or financial strength and defame in society. I want to learn vasthu importance and its links? Vastu consultant in Maine, looking for vastu services? My cousin is always facing Accidents, what is the reason? Vastu consultant in Hawaii, looking for the vastu consultancy? I want to learn some thing about my kids bedroom Vastu Shastra? I want to know the best head positions or sleeping positions as per Vastu? Is my cot or bed is towards South, is it right or I have to move to Southwest? I want to know some inauspicious positions of bed or cot in bedroom, so I can avoid? I have a East facing home with T road on the East part of the North East. What do you think about such a home? I am planning to buy a plot of size 70ft x 50ft which is a corner plot with south having 40ft wide road and east having 30ft wide road and at northeast corner from east face there is one perpendicular road of 30ft wide hitting . What are the comments whether i can buy this plot or not.